The seat cover is not machine washable. RECARO has been traditionally associated with manufacturing car seats for racing cars, and is generally regarded as the best in the business. So, when you find out that the new convertible car seat that you are planning to purchase for your baby is made by RECARO, you automatically feel a bit more assured and satisfied about the overall safety features and capabilities of the safety seat you are about to purchase. The new RECARO ProRide convertible car seat is a premium, high quality car seat which promises to deliver comfort and safety of the highest level to your most precious passenger, your baby. At first glance, you are immediately attracted by the Side Impact Protection offered by the new ProRide. 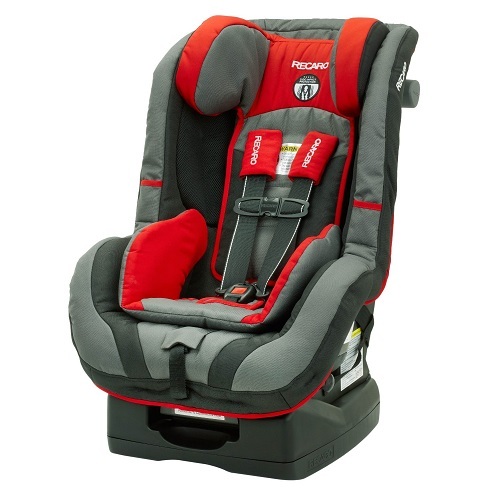 The seat is designed to distinctly protect five most important areas of body – head, neck, face, pelvis and torso. It looks comfortable and stylish and yet, is undoubtedly strong and sturdy. 1. The racing car inspired Side Impact Protection system, which has been tested by international standards to provide increased safety levels to the most important areas of a kid. The head wings are soft enough to be comfortable while your kid is sleeping, while at the same time they are firm enough to protect the head and face if a crash happens. The Radian XTSL is the only other convertible seat which comes with comparable head wings in this price range, but ProRide edges it out when it comes to its other features. For added safety measures, the seat also has been reinforced at the sides to stabilize the torso and the pelvic region of the body. 2. EasyAdjust No Rethread 5-point Harness – We all know how tedious and annoying rethreading the 5-point harness can be, as the baby grows with age. However, ProRide’s 5-point harness can be adjusted by simply turning a knob, thus avoiding the re-threading process completely. This is where the RECARO ProRide scores over the Britax seats, which usually has to register complaints by customers about how their kids grew the seats much earlier than expected. 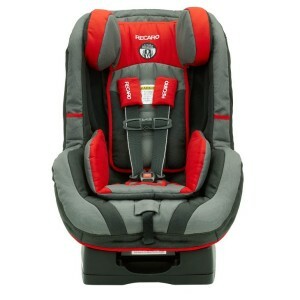 The RECARO ProRide and the Radian XTSL have the highest height limit when it comes to convertible seats in the market, and along with ProRide’s EasyAdjust 5-point Harness, your child will be making use of the seat for much longer than say, a Britax Boulevard 70. 3. A push button Built-in LATCH system along with LATCH storage, and a universal top tether (forward-facing) has been grafted into the seat to ensure your child stays safely strapped to the seat, without any discomfort. However, while the latch clips and the chest buckles are easy to fasten, customers have found it a bit hard to use the crotch buckles. This may or may not be a bad thing, considering the fact that it will be impossible for a toddler or an older kid to unfasten those buckles while you are not looking. However, when required to undo them (say in a crisis), it will require a bit of an effort to do so. 4. The RECARO ProRide is aptly made for using as a Rear-Facing seat (for 5-40 lbs) and as a Forward-Facing seat for babies weighing 20-65 lbs. The child height limit for ProRide (while forward facing) is significantly higher than its competitors at 50 inches of standing height, and thus it will serve you for a longer period of time. It also features a Lock-Off mechanism that locks the seat belt in the belt path for maximum safety in the forward facing position. 5. The RECARO ProRide convertible car seat also boasts of an ergonomic shell structure for comfort, which is covered in a breathable, CoolMesh air ventilated fabric. While the fabric of the seat is well constructed and stitched, the air ventilation system helps a lot if you are a resident living in a typically hot area. The different colours of the seat are made up of different fabrics, so you will do well to choose the fabric (and not the colour) which will suit the climate of your area, e.g the seats which come in all-black and grey are made of plush velour, which tends to get more heated as compared to the fabrics of other colours (say blue or red), which are actually made of a smoother fabric that wicks moisture. 6. A Safety Stripe System, again a racing inspired white safety stripe has been deployed on the outside edge of the 5-point harness, which alerts you in case a twist has occurred or is about to occur, thus avoiding a possible safety hazard. 7. An EasyAdjust Head restraint has been placed with a protective layer of real automotive PUR foam, which while ensuring a comfortable head rest for your toddler , also provides a firm protecting guard for the head (when coupled with firm head wings which limits the movement of the head). A far superior product, the RECARO Performance Ride is already available at just about $20 more. The RECARO ProRide Convertible car seat is undoubtedly a premium, high quality product which manages to combine safety and comfort in the best way. Customer feedback to the performance of the seats has been outstanding and the most important thing when it comes to a convertible seat made for babies, the safety standards, exceed the US standards and are at par with the much higher European standards for car safety. The RECARO wins over its other competitors like the Britax and Radian, thanks to its host of superb safety features and cheaper price (than Britax and most of other premium convertible seats). The only setback is the positioning of the ProRide’s price so close to that of the Performance Ride’s. At $20 more, people will have to think twice before going for the ProRide instead of the Performance Ride, which according to us is a better product!